ColorCasters provides professional color management services and as well as working with software and hardware companies to develop products that provide a path to more consistent color. 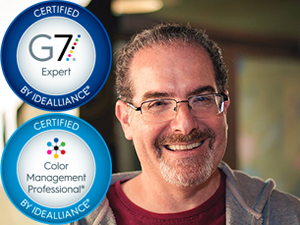 The company was founded out of needs identified by Jim Raffel, a certified Color Management Professional and G7 Expert by IDEAlliance, as he consulted with clients worldwide. ColorCasters focuses on printer calibration, color verification and process control in the conventional, digital and inkjet printing environments. Now as CEO of ColorCasters, Jim is still out there providing the highest quality professional color management services available. 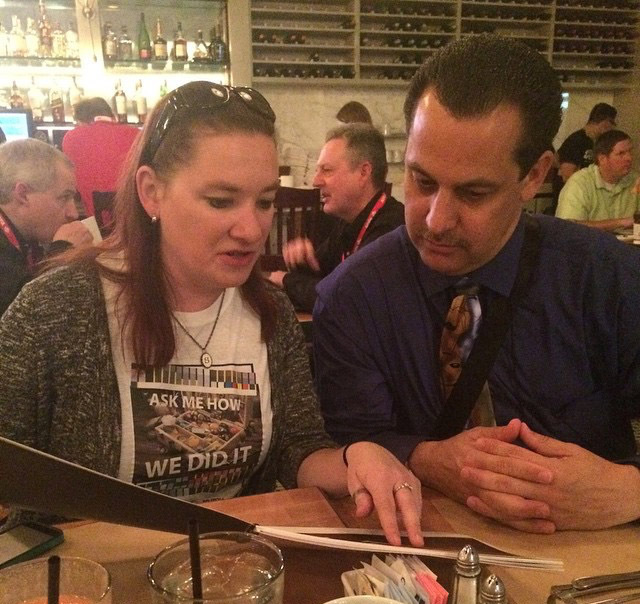 Joining Jim in ColorCasters’ color management and consulting services is Shelby Sapusek. As CMO, she handles the company’s messaging and project management, but she’s also a certified Digital Color Professional Instructor through SGIA. So like Jim, you’ll find Shelby out in the field helping clients and customers with their color management. The 200-inch direct dye sub inkjet printer: This client asked us to come in and achieve a common visual appearance across two fabrics and a carpet substrate they print on this monster of a machine. We calibrated the printer using a grayscale methodology and then created custom profiles for each of the three substrates. When we were all done, the client loved the clean and bright color as well as the overall common visual appearance across the three substrates. The photo lab reinventing itself: This photo lab had a long and distinguished history before digital cameras became popular. They needed to achieve a common visual appearance across RGB photo printers and CMYK(+) inkjet printers. In the inkjet realm, they print both direct to photo paper and dye sub to be transferred to a variety of surfaces. Another issue was addressing the mix of RGB and CMYK images in the workflow. Let’s just say we love a good challenge and look at situations like this as opportunities to help a client grow! Jim continues to spend many weeks a year on the road providing professional color management services to clients across North America. When you need custom ICC profiles for your inkjet, digital or conventional printing devices, we are the ones to contact. We do more than build the profiles and walk away. As part of all our professional color management services we leave behind a copy of our sister company ColorMetrix’s ProofPass solution. This allows ongoing monitoring of the color we’ve helped you achieve and lets everyone involved know when and if it’s time to adjust the color again. There is no more guesswork; just empirical facts to help you run your business professionally.